NEW ORLEANS – Bitter cold might be enveloping the entire nation, but collegiate track & field athletes are heating up. There were numerous marks that ended up on either the all-time top-10 of the collegiate indoor record book or in the respective divisions. How do you stand out on a weekend where several men etched their names into the top-10 of the collegiate indoor record book? Just put your name higher than theirs. Payton Otterdahl unleashed a titanic throw this past weekend at the Mark Colligan Memorial, which left him just inches away from the collegiate record in the shot put. Otterdahl launched the orb 21.64m (71-0) on his fifth attempt and moved into third place on the all-time chart behind Ryan Crouser and Ryan Whiting, who are both tied at 21.73m (71-3½). He joined Crouser and Whiting as the only men to eclipse the 71-foot barrier in NCAA history. Before today, only 2 collegians had ever reached 71 feet in the indoor shot put. The senior from Rosemount, Minnesota, is also ranked No. 1 nationally in the weight throw at 23.68m (77-8¼), a mark he achieved two weeks ago at the Thundering Herd Classic. When you couple both of those marks together, he is the only athlete in collegiate history with marks of 21.60m in the shot put and 23.60m in the weight throw. Otterdahl is the first athlete from North Dakota State to be named National Athlete of the Week during the indoor season. Payton Chadwick is a big reason as to why the Arkansas Razorbacks have been ranked No. 1 in the NCAA Division I Women’s Indoor Track & Field National Rating Index for the past three weeks. She proved it this past weekend at the Razorback Invitational. Chadwick took advantage of the fast track inside the Randal Tyson Track Center and clocked a pair of national top-2 times in the 200 (22.97) and 60 hurdles (8.01) and had an important carry on the national-leading 4×400 relay team (52.46; 3:31.26). She is also ranked in the top-35 nationally in the 60 based off a result earlier this season. 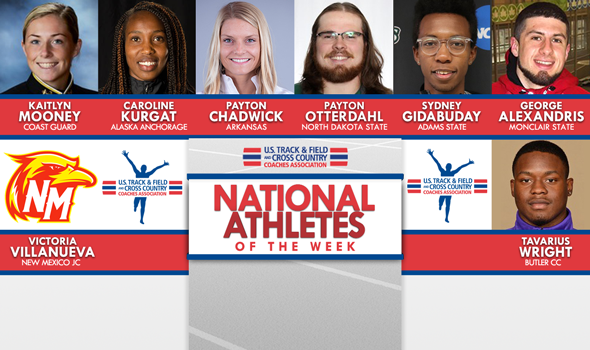 This is the first time that a non-vaulter from Arkansas was named National Athlete of the Week during the indoor season. Sandi Morris (February 3, 2015) and Lexi Weeks (February 21, 2017) were the other recipients. Sydney Gidabuday picked up his second career National Athlete of the Week honor during the indoor season after blistering the track in the 3000 at the Dr. Sander Columbia Challenge this past weekend. Going up against a field of professional athletes that included several past NCAA champions, Gidabuday finished sixth overall and posted a time of 7:54.77 to set a new NCAA Division II record, besting the old mark by two seconds, which was previously set by him back in March of 2017. Caroline Kurgat is the National Athlete of the Week for the second week in a row after continuing to set new benchmarks at the NCAA DII level. The senior ran the best 5000 across all divisions this past weekend as she recorded a 15:28.46 to win the event at the UW Invitational against a field composed of professional and NCAA DI athletes. The mark is the all-condition best ever posted by an NCAA DII athlete, bettering the old best by more than 30 seconds. Kurgat has now posted national-leading marks in the 3000 and 5000 in back-to-back weeks. George Alexandris won’t only be competing in the long jump at the NCAA Division III Indoor Track & Field Championships at this rate. He’ll be all over the track and the field. This past weekend at the Pioneer Open hosted by Utica College, Alexandris shot into the national lead in the long jump, into the top-2 nationally in the 200 and into the top-12 nationally in the 60. Alexandris, who is the reigning outdoor long jump champion, soared 7.46m (24-5¾) in the event for the title, clocked a time of 21.90 on a flat track in the 200 and won the 60 in 6.94. This is the first time that Alexandris has been named National Athlete of the Week during the indoor season. Kaitlyn Mooney, NCAA Division III record book. NCAA Division III record book, Kaitlyn Mooney. Chances are you’ll get to know each other quite well over the next few years. Mooney clocked the third fastest time in NCAA DIII indoor history in the 3000 this past weekend at the John Thomas Terrier Classic. She crossed the finish line in 9:27.25, which put her seventh overall in a stacked field against four professionals and several NCAA DI athletes. Tavarius Wright is the National Athlete of the Week after picking up a win in one of the most exciting races this past weekend. The freshman took first in the 60 at the Pittsburg State Invitational with a time of 6.64, which makes him the eighth best performer all-time in the event in NJCAA history. It is also the best in the NJCAA this season. What made the race truly exciting was that it featured two NJCAA athletes running away from the field. Wright bested Don’Drea Swint of Coffeyville CC by milliseconds as each ran a 6.64. Swint ended up as the ninth best performer in NJCAA history. Wright becomes the second athlete in Butler CC history to earn the award.